Just days before Xiaomi is reportedly holding an event to introduce at least one new handset, rumors are swirling all about. 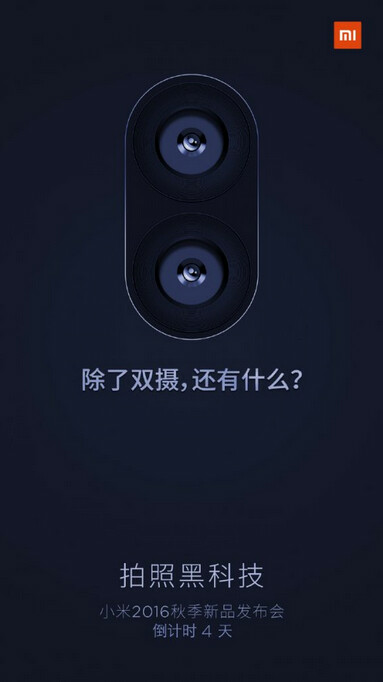 As we told you on Thursday, the latest reports out of China seem to indicate that the highly-spec'd Xiaomi Mi 5s that we've been looking forward to, will actually be called the Xiaomi Mi Note S.
Friday morning, a new teaser was released by the manufacturer that tells us to expect a dual-camera setup on the back of at least one new Xiaomi handset. After weeks of passing along rumored specs and pricing, we also expect that one new high-end model will be powered by the Snapdragon 821 SoC, carry 6GB of RAM and offer variants with 64GB, 128GB and perhaps 256GB of internal storage. This new model could have Qualcomm's ultrasonic fingerprint scanner embedded under the screen, and come with Quick Charge 3.0 to quickly power up the battery. Prior to the new teaser, we were looking for a 16MP rear-facing camera with a 4-axis OIS, PDAF laster focusing and an aperture of f/1.8. Last weekend, Xiaomi supposedly sent out invitations for an event that will take place on September 27th. We could see the new high-end phone, regardless of whether it is the Mi 5s or Mi Note S, officially introduced on that date. If it is in surely gonna buy it. Wow specs, but what's the actual screen size? I guess atleast 5 inches, if it's a Mi 5s, and 5.5 inches, if it's a Mi Note S.
5.5 would be great, I might end up buying it.